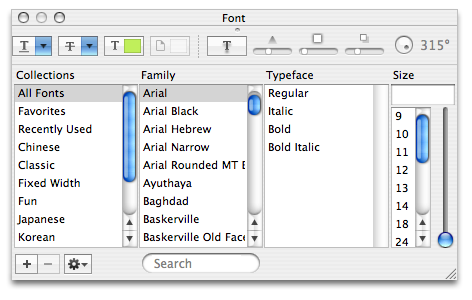 The font panel is a floating window that displays font information for the selected object, attribute, or window. As the selection changes, the font panel updates to show you its font information. Choose Show Fonts from the Object menu to show the font panel. 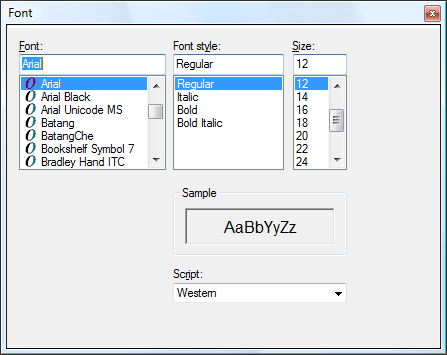 To close the font panel, click its close box, or choose Hide Fonts from the Object menu. With objects selected, choose Show Fonts from the Object menu. The font panel appears showing the font information currently assigned to the selected object. Choose the font, size, or style you want to apply from the font panel. As you make changes, the selection will update to reflect your changes.